Wednesday was a busy day for Sony. The company’s gaming division used the Games Convention in Leipzig, Germany to reveal a number of new hardware offerings. Topping the list was a new SKU for the Playstation 3 platform. With Sony’s focus evolving more and more toward connected entertainment, “PS3 owner’s are demanding more storage capacity,” said Jack Treton, President and CEO of SCEA. Sony will try and answer the call with a 160GB capacity PS3. Note: Just a month ago in July at the E3 conference Sony was talking about phasing out the 40GB model of the console in favor of the then announced flagship, 80GB model PS3. Now just a month later, with the $399 priced 80gb model nearing delivery (shipping to stores), the news flash is a 160GB model coming in November for $100 more? From a product marketing point of view, the message seems to be a little confusing. Is a $100 difference enough to shift a customer’s buying decisions? Or will it just complicate the purchase decision? In these questions, there’s a hint of a replay of the kinds of mixed messages that hindered early Playstation sales and left more than a few watchers scratching their heads and asking what Sony was thinking. In addition to the console, Sony is also rolling out an upgrade to their PSP portable system. The new PSP-3000 is an evolutionary change that will share the majority of the features found on the current slim PSP-2000. The new model, however, has been upgraded to offer a better anti-reflective LCD screen and an on board microphone for use with Skype or other Internet telephony services. The PSP-3000 will also have a 480i output when connected to a TV screen. The PSP 3000 will go on sale in October for the same price as the current model ($199 bundle). A $169 standalone model is also expected. In addition to the two slight platform changes, Sony also announced a wireless keypad accessory and an upcoming music video channel for the PS3 (and by remote play to the PSP) called Vid Zone. The service is expected in Europe in early 2009 and will feature a library of more than 10,000 on demand songs. The service sounds similar to some of the offerings available through Microsoft’s rival Xbox Live environment. (About a week ago, Microsoft announced a deal with Warner Music Group to show their videos through Xbox Live). No US date for VidZone has been announced. 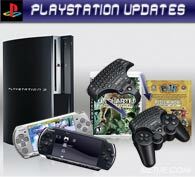 Sony confirmed Wednesday that there will be cross compatibility for music game controllers for the PS3. Specifically, instruments for Guitar Hero: World Tour, Rock Band 2 and Rock Revolution should all be interoperable. The word from the Microsoft camp is that the Xbox 360 versions of the games will also share the same instrument compatibility. •Sony Shortcomings: Dear Howard, What about What Customers Want?